This is the base all around peacock herl that everyone knows and uses. All sizes and codes are listed here, and only 6-8 inch comes in dyed colors. PSHS Small Bag - 1/16 oz. ​PSHL Large Bag - 1/4 oz. PSHXXS Select 12" to 14" - 1/8 oz. Premium quality swords. Fibers are fairly stiff and strong and are ideal for tails, toppings or wings on nymphs, classic wet flies, salmon or steelhead patterns. We buy the finest quality available. 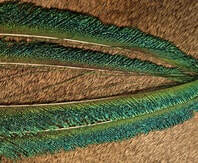 The dyed over natural sticks retain the natural iridescence which helps make peacock herl such a beautiful and effective material, while receiving a subtle amount of dyed color. 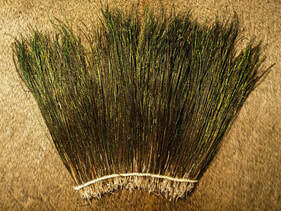 The dyed over bleached sticks are initially bleached to a light tan color and then dyed. The dyed colors tend to be more true, in other words the red is really red. THEY'RE BACK!!!! 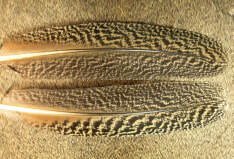 Mottled Peacock Wing Quills are highly sought after for their specific designs. Used heavily for muddlers, and classic salmon/steelhead patterns. 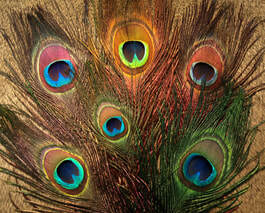 All three colors have the peacock iridescence so attractive to fish and fishermen. 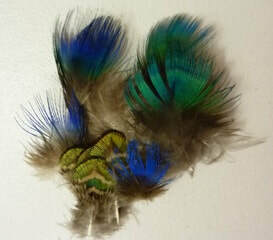 Both the blue and green feathers may be used for cheeks or collars The gold feathers are smaller, with thicker fibers suitable for cheeks, tails or legs.